Sociable Lapwing is olive-brown on upperparts, throat and breast. Belly is black end chestnut. Vent and undertail coverts are white. Rump and uppertail feathers are white with subterminal white crescent-shaped patch when in flight. Wings show white secondary feathers and the wing tip is black and triangle-shaped. Head is olive-brown and show a conspicuous white supercilium which extends from the forehead to the nape. Chin is white. Crown and lores are black. A fine black eye-line extends to the rear of the eye. In breeding plumage, cheeks are buff. Bill is black. Eyes are dark brown. Legs and feet are blackish. Sociable lapwing is classified as VULNERABLE species which slowly and inexorably declines. This decline of about 90% since 1990s is due to the rapid cultivation of the steppes, and to the important development of grazing on the remaining grasslands. Numerous nests are destroyed by cattle and agricultural activities. Its main predator is the Rook (Corvus frugilegus). The Sociable Lapwing has become very rare today within its range. Female is duller than male, mainly on belly. Non-breeding adults have pale buff supercilium and paler belly. Juvenile is similar to non-breeding adult, but it shows scaled effect due to the buff edges and black subterminal bar on the upperparts’ feathers. Crown, face, neck and breast are heavily streaked. When in flight, we can see the white secondary feathers and the conical subterminal black patch on uppertail feathers. Sociable Lapwing utters typical repeated, raucous «kretsch,kretsch,kretsch» on breeding areas. It also gives some rapid, raucous « rekrekrekrekrek » as alarm call. This bird is silent outside the breeding season. Sociable Lapwing breeds in steppes, desert and arid areas, cultivated and ploughed fields. During migration, it mainly frequents sandy plains with short grass, dry grasslands, fallow lands and cultivated areas. It winters on burnt savannahs and steppes, uncultivated wastelands, pastures and harvested millet fields. This species is usually found near water. Sociable Lapwing breeds in Russia and Kazakhstan. It winters in Sudan and Eritrea, Israel and Arabian Peninsula, Pakistan and NW India. Sociable Lapwing is monogamous. Before start of breeding season, groups of about 5-10 birds perform some displays in front of females. These displays consist in territorial fights between males. This species breeds in loose colonies, with other nests 25-50 metres apart. These colonies gather between 5 and 20 pairs. Each pair defends the territory and the nest-site. Sociable Lapwing is migratory. It leaves the winter areas in March-April and arrives at breeding areas between mid-April and early May. It migrates in August-September according to the years. They migrate in small flocks of up to 15-20 birds. This species is diurnal. To feed, the Sociable Lapwing walks quickly, catches the prey and continues again in the same way. It feeds primarily on insects and spiders, but it also consumes seeds and other plant materials. Sociable Lapwing has usually slower flight than other lapwings, performed with steady but slow wing-beats. Breeding season occurs in spring, one month later in the northernmost parts of the range. 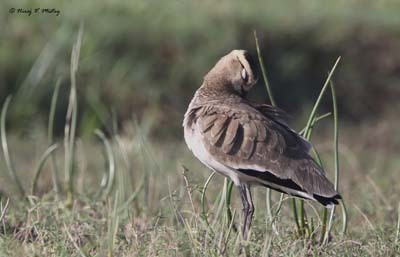 Sociable Lapwing nests on the ground, on bare saline areas or in short vegetation, close to the water. The nest is a scrape, unlined or lined with some plant materials, pebbles and debris collected during the incubation period. Female lays 2-5 eggs. Incubation lasts about 22 days, mainly by female. Chicks have pale buff down with black spots and streaks above, and buffy-white down below. They fledge about 35-40 days after hatching. This species only produces one brood, but replacement clutch is laid if the first is destroyed. Sociable Lapwing feeds primarily on insects such as grasshoppers, beetles, crickets and moth larvae. It may swallow some small stones, bones and shells. The diet varies through the breeding season. During winter, its usual diet consists in grasshoppers and other insects.